It exhibits both protectant and curative action. 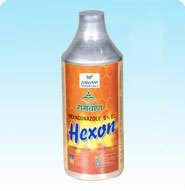 It controls leaf spot and rust of wheat and sheath blight, leaf scald and rice blast diseases of paddy. Highly stable, compatible and cost effective. Versatile in application, can be applied as seed dressing, soil drench, seedling root dip, foliar spray and post harvest treatment. It can be applied to a variety of crops and plants including Wheat, Sugarcane, Paddy, Cotton, Vegetables, Potatoes, Apples, Mangoes, Chili, Grapes and Tea. As per the occurrence of symptoms.